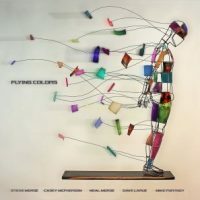 Flying Colors is a pop-heavy progressive rock album that successfully makes use of the supergroup format. Contemporary prog rock giants have formed to create a fantastic album of accessible rock tunes that are expertly composed and unforgettable. Executive producer Bill Evans dreamed of creating another powerful supergroup, drawing up a list that included Mike Portnoy (Dream Theater, Transatlantic), Steve Morse (Dixie Dregs, Deep Purple), Neal Morse (Spock’s Beard, Transatlantic), Dave LaRue (Steve Morse Band), soon-to-be well-known Casey McPherson, and lead by producer Peter Collins. The result is an album that is truly collaborative, and it shows. All the members’ muscles are flexing at the opportune moments, never adding a wrong note. The album is filled with a heart and groove that lasts from “Blue Ocean” all the way to “Infinite Fire”. The album may actually be the best representation of the Kevin Gilbert style, at least its the closest thing since his unfortunate death. The songs are poppy and rocking, positive and introspective. Not one instrument stands out among the others, everything is at the right level, contributing to the band and the song. Despite the relatively large personnel engaged in this album, each song, and the album as a whole, never leans on any one particular talent. Instead, the group as a whole have executed a balanced work that is both catchy and diverse. From poppy love serenades to aggressive rants, Flying Colors is a gem for 2012. “Kayla,” “Love is What I’m Waiting For,” and “Everything Changes” are stand out tracks, but every song on the album is worthy and will remain stuck in your head, whether you like it or not. There is a air of both fun and maturity on this album. Relatable themes of love, worldliness, and aggravation are all present. The album’s cover alone, which is clever and artful, shows a human figure’s patch work of colors and textures peeling off its body in a tremendous wind. The diversity of the colors and textures represents the variety of the styles in the album’s songs, making it an apt depiction of the album’s contents. With the unknown Casey McPherson taking the lead vocal role, his inclusion into the band is as perfect as can be. Never over-the-top, McPherson provides the passion and delivery necessary for each song, and his vocals are the perfect pairing for the diversity found in Flying Colors. As a supergroup, Flying Colors is a lovely collaboration between friends old and new. Although project was conceptualized and completed rather quickly, there is a unique passion and a near perfection to the album that is rarely heard today. The progressive attitude is clearly heard and the yearning to produce accessible music that cuts across a variety of demographics seems unintentional but sincere. 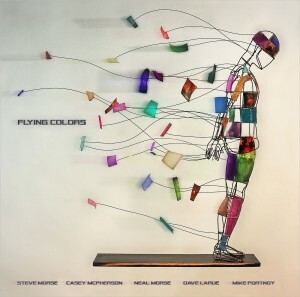 If any member has an obvious stamp left on the album it would be Neal Morse, but once again, Flying Colors has a collaborative nature that makes both the band and the album unique and welcomed.